Sprague was incorporated in 1883, the same year the Northern Pacific Railway finished its transcontinental line through the city. In its early days, Sprague was a center for sheep shearing and shipping of wool. 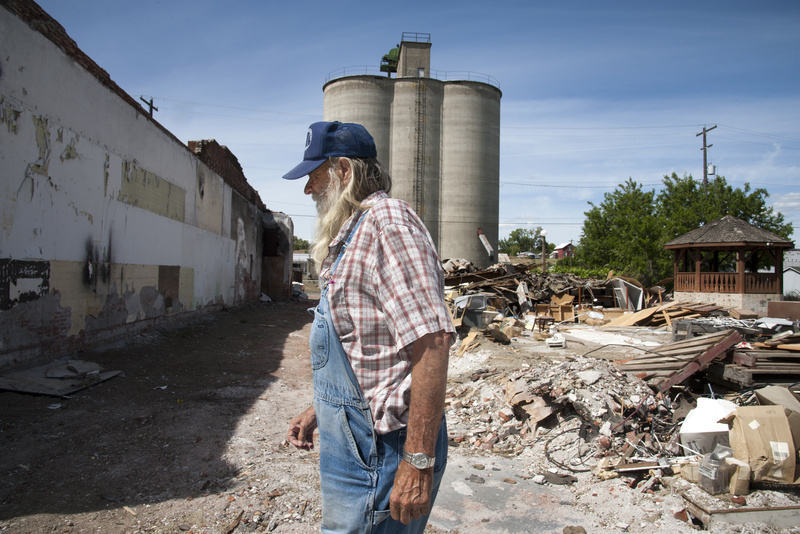 SPRAGUE, Wash. – A building collapse last September in this quiet city 40 miles southwest of Spokane is threatening the future of its historic downtown. Last month, the Washington Trust for Historic Preservation put Sprague on its 2014 list of endangered historic places. The listing is calling attention to dire circumstances in Sprague, but it comes without any direct help. “I wish we had the resources to drop in like a preservation SWAT team, but we don’t,” said Chris Moore, executive director of the historic trust. Sprague Mayor John Eagleson said the building collapse sent a shiver through the community, and people worry that some of the city’s other old brick buildings might collapse, too. The uncertainty has damaged what little business activity was going on in Sprague. “Sometimes when you are knocked down and so low, the only way to go is up,” the mayor said of hopes of a revival. Margie Hall, executive director of the Lincoln County Economic Development Council, said she asked the historic trust for the endangered listing as a call for help. As a result, a structural engineer from Seattle offered to undertake a survey of remaining brick buildings on First Street, Hall said. She said she hopes the engineer will be able to recommend what needs to be done to preserve them, if that’s even possible. The future of Sprague could hinge on it. Located along the Interstate 90 corridor, Sprague, with a population of 445, is often just a stop for gasoline and a snack. But there is more to the city than that. The area is known for its good fishing and hunting as well as rolling wheat fields. A trio of auto and antique collectors has created a buzz in recent years with classic old farm trucks and Detroit cars lining both ends of First Street, which was once the state highway. Dorothy Giddings, 83, runs a pair of antique and junk shops a few doors from the building that collapsed. The collapse tossed debris across First, forcing closure of the street because of the risk that adjoining buildings might go, too. The city ordered Giddings to evacuate. Unshaken, she reopened her business as soon as the city gave her the go-ahead in March. She said her 1897 building is strong. “This old building will be here when we are dead and gone,” she said. Giddings and her husband, Gary, have become downtown fixtures. In addition to the shop, she operates an online business selling antique auto parts with Dave Thompson, another Sprague resident. She has acquired vacant grain elevators in Sprague and Lamont to hold her growing collections and hopes to use her shop to sell them, she said. Thompson’s wife, Jewelle Papan, is listed as the owner of the building that collapsed. Giddings said Papan and Thompson have been in a dispute with the city over the cause of the collapse. The three of them believe that a leaking irrigation pipe next to the collapsed building weakened the footings, which triggered the collapse, Giddings said. Eagleson said the city disputes that contention and wants Papan and Thompson to continue cleaning up the debris. The mayor said there was no insurance on the collapsed building. The Sprague City Council voted recently to have the lot cleared by the city, if necessary. Eagleson said he would prefer to let the owners finish the work. Thompson said he’s been getting help from a church group from Cheney, but declined to comment on his issues with the city because the incident has become a volatile subject in town. He said he is concerned that the old mercantile and hotel building at the west end of the block may collapse. A building that housed a veterinarian clinic next to the collapsed building has since been demolished through an insurance settlement, Eagleson said. Sprague was incorporated in 1883, the same year the Northern Pacific Railway finished its transcontinental line through the city. It took its name from Union Army Gen. John Wilson Sprague, general superintendent of the railroad. In its early days, Sprague was a center for sheep shearing and shipping of wool. It held an economically important roundhouse for locomotive maintenance. A fire in 1895 destroyed the rail facilities; they were rebuilt in Spokane, changing Sprague’s economic fate. Following the collapse and street closure last year, at least three businesses closed, including a restaurant-bar, real estate office and beauty salon. Hall, of the Lincoln County Economic Development Council, said Sprague could become a place known for its “old wild West look and feel,” but confidence has been damaged so badly the city may never reach that potential. “It’s been tough on them, for sure,” she said.